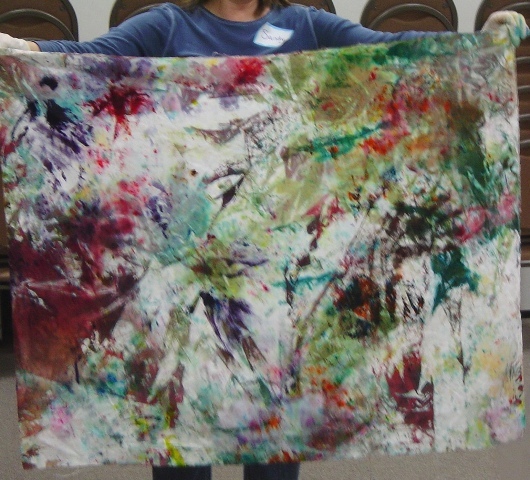 During the Paducah quilt show, I was asked to demo at Rend Lake. 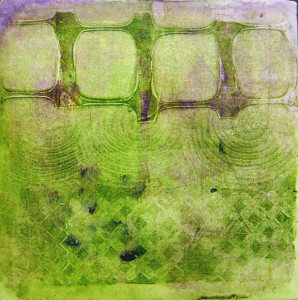 I actually took a few things to demo but one of the easiest things to demo is mono printing on a gelatin place. I did some with fabric and some with paper. Then I played with the paper ones in Photoshop. Fun results! Such yummy patterns. As you can see I haven’t blogged for some time. June was a really busy time for me. I was creating two brand new classes…and then trying them out on my “guinea pigs”! Postcard Panache was the first class. I had the actual idea for this class last summer, but like anything else, if there is no demand for something, my ideas may remain just that…ideas. But in March this year, two ladies from Louisville put a demand on me for this class, so I worked hard to get samples made and get it prepared so they could have a full day of learning. These two ladies came to my house for the day and seemed to thoroughly enjoy it. Now I just have to get it up on my Lectures/Workshops page. There is always something to do! 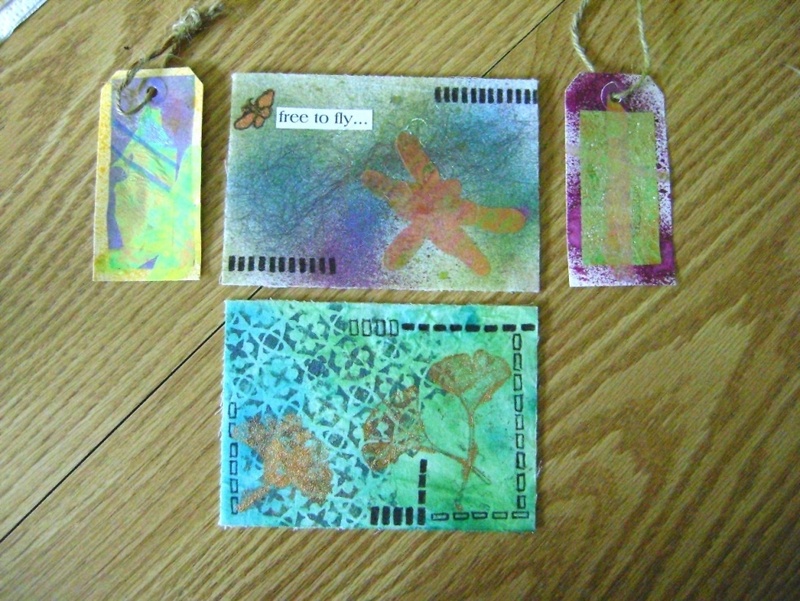 Postcard Panache is a class geared to teaching people how to use all of the new artsy products that are on the market. I sell all these products at quilt shows, but demos are important because people don’t quite know what to do with Angelina fibers and other items. So, in postcard format, I showed these ladies a number of ways they could use bottled inks, Smooch Spritz, Angelina fibers and film, BoNash bonding powder, foiling glue, foil, stencils, etc. They had quite a play day and were very complimentary, which makes me feel happy that they were so pleased. 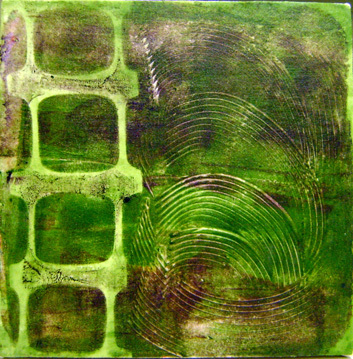 The second class I created is a screen printing class. 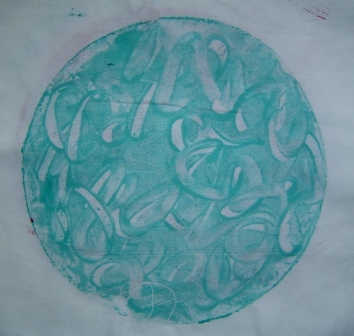 I finally settled on a name for it no one else has used, at least not that I know of…Spontaneous Screen Printing. Several gals from the St. Louis area and other friends of mine signed up and declared that they had a great time and learned a great deal, so I feel I have done my job. It is a lot of work creating and planning a brand new class, then packing everything for it. At the same time I was planning a demo on Friday for the artisans center where the class would be taught the following day. 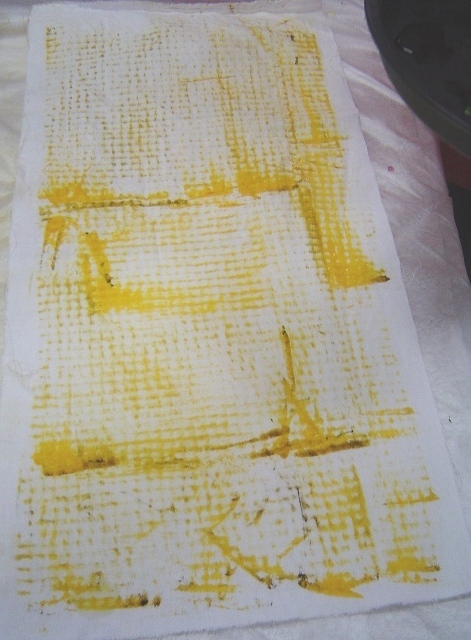 Due to the extreme messiness of using dye paints to demo I opted to do something totally different! Which made me even more work…what was I thinking? Again, it was a project that had been in the back of my mind for some time, so in a way, by demo-ing gelatin printing using paints, I got some “work” done for future artwork…AND I got a commission out of it too, which was very unexpected, but welcome. I’m such a slacker on this blog! I really didn’t have much of anything interesting to report. 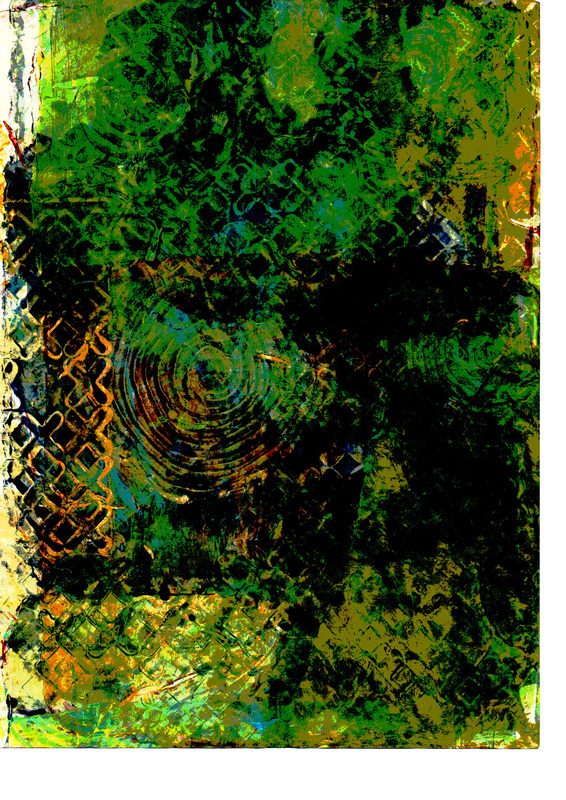 I have been getting ready to teach and vend, so have not been making any art, that’s for sure. I have some new products to sell and the class I taught last weekend was machine quilting. What’s there to say about that? I do have a sample that I quilted with my Featherweight machine. That might be interesting to see. A complaint I have about stitching this way on the Featherweight, and it may be a problem unique only to mine and not to other machines, is that when the needle goes down in the hole a second time, a pretty noticeable knot appears (at least with black thread on white cloth). But I made the sample to show my class that it is possible to do this on a Featherweight. 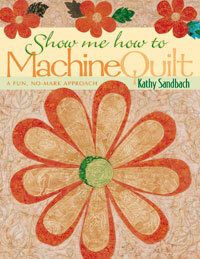 I love Kathy Sandbach’s books on machine quilting. 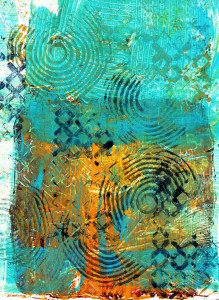 The one I used for the class was Show Me How To Machine Quilt. 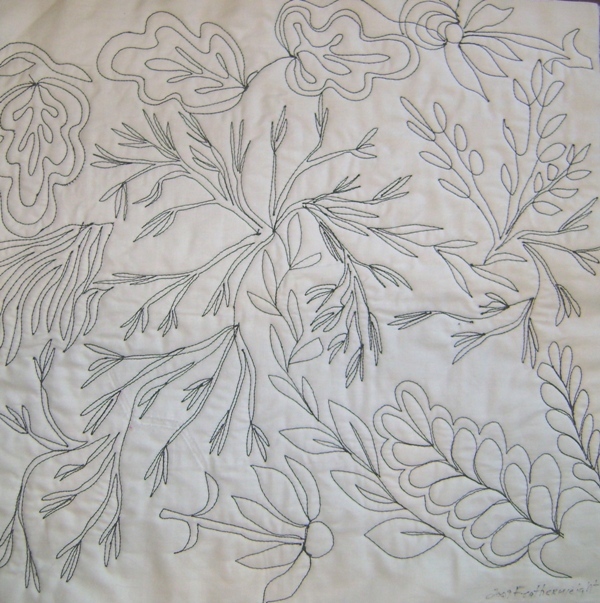 She has developed a method of creating unique continuous line designs in stitch for quilts with diagrams showing how to start and continue. 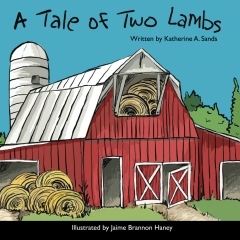 It’s a great book especially if you are looking to go beyond stippling and other filler designs. I have some left over from the class. They are $16.95 plus shipping. They are not up on the website yet. 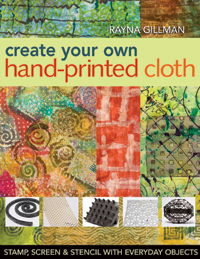 Another piece of news: I now have Rayna Gillman’s book for sale on my website! See here. Well, I guess that’s all for today…hopefully it won’t be so long between posts this time! What…my first post for March…I have been busy. I would have posted last Monday but I was packing and getting ready to leave, and putting the final touches on a lecture and workshop. I traveled to Greenwood, IN (outside Indianapolis) on Tuesday to visit my artist friend, Cynthia. This is now a yearly trip. Her quilt guild asked me to do a workshop with them and the program for their monthly meeting. It was lots of work getting ready as I was preparing something new. 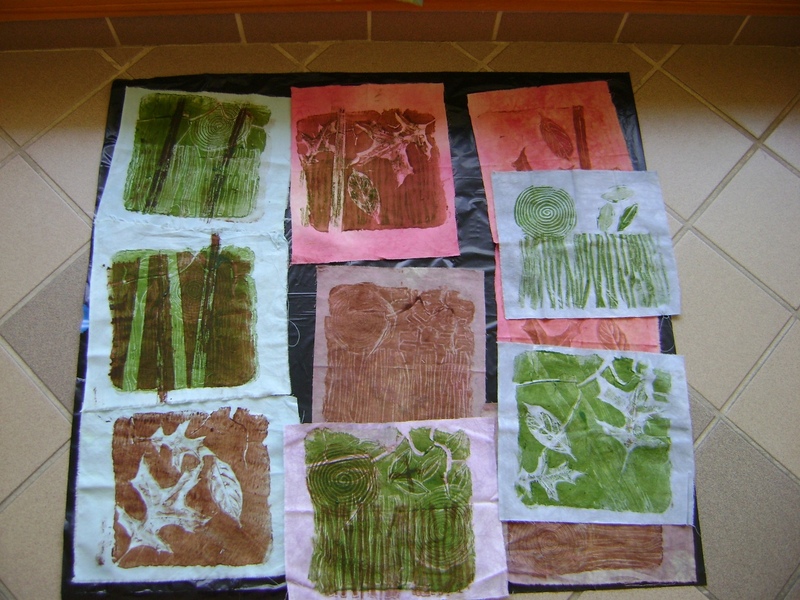 The workshop was on Dye Painting. 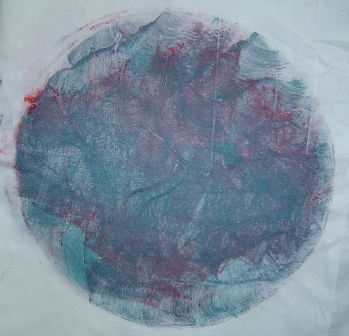 They did rubbings, stamping, monoprinting, gelatin printing and I had some screens made up for them to play with. 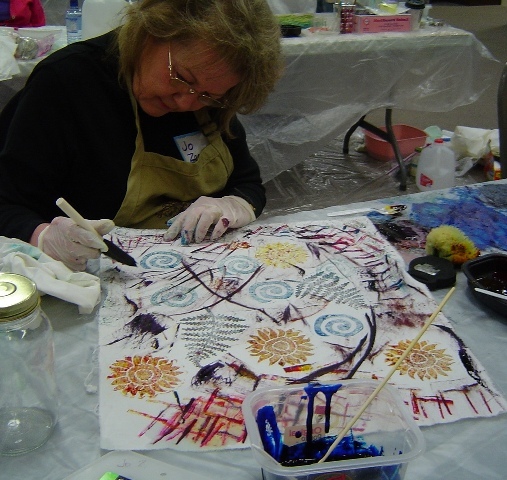 Here is Jo working on a stamped piece of cloth. …a monoprint carefully planned and executed by Mary…. …and Sandy’s 1 yard size clean up cloth. 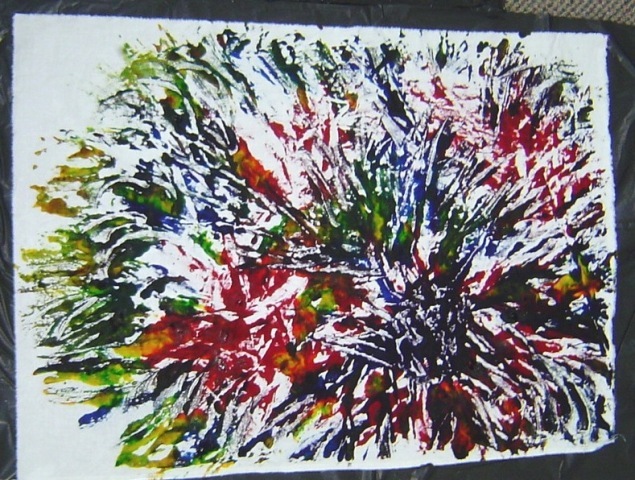 I thought it was an awesome piece and urged her to save it for some special idea. I think everyone said they had a good time and we didn’t make too big a mess. On Thursday, Cynthia and I went to the Indiana Heritage Quilt show in Bloomington, IN to see vendors, friends and quilts. 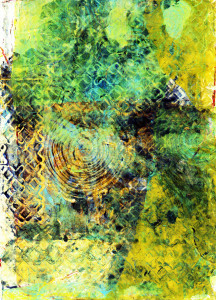 That evening I gave a program on Journal Quilt Techniques for the guild, showing them some of the quirky things I do on small art pieces. All in all, a fun and exhausting time…I drove home Friday morning after sleeping in. Now…to get ready for whatever is next…. A couple of weeks ago I promised to post pictures of my gelatin printing results. I hadn’t gotten around to photographing them, because I just wasn’t sure I was satisfied with the results. 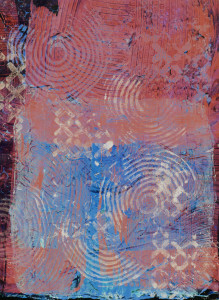 I don’t know if my dissatisfaction is because the prints are round (I used the cheesecake pan), or what it is. For me, the texture freak, I usually go for backgrounds with texture and color. 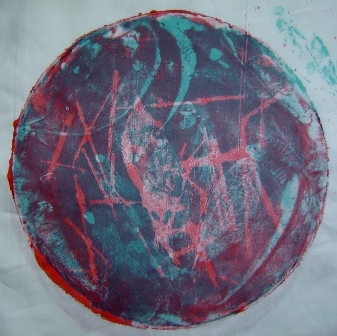 I’m not necessarily about making a “picture” when I monoprint, so maybe that’s why I wasn’t so terribly thrilled with the process, but here are a few pictures of what I did that day. 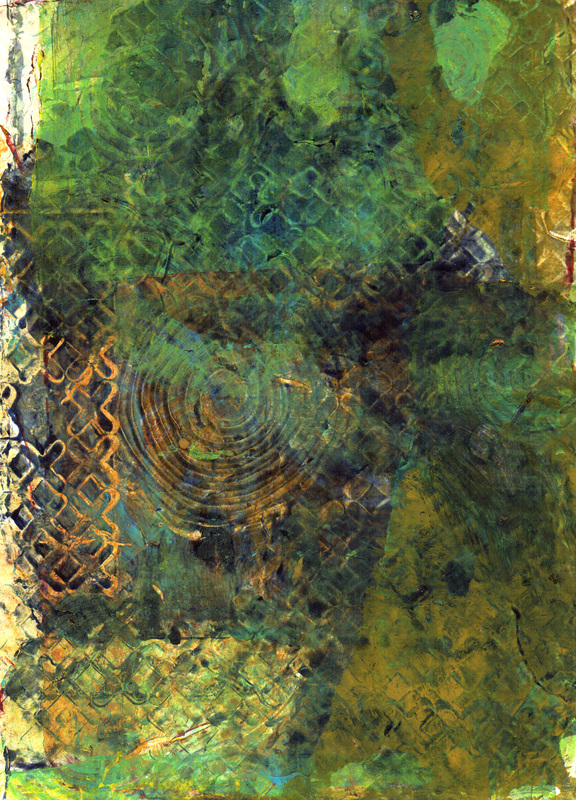 I used paint rolled on with a brayer and then swirled my fingers through it to make the design. This is two prints, one on top of the other (need more colors!). 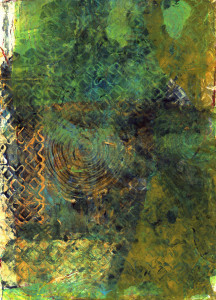 I laid grasses and leaves on the paint to make both prints. I think this one is pretty cool. 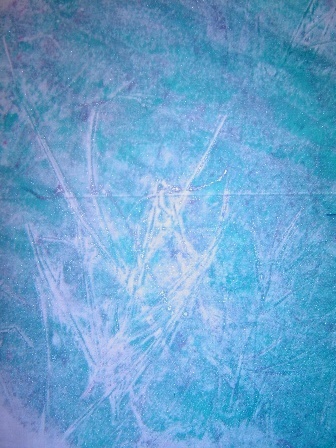 This is a closeup of one with grass laid on it. 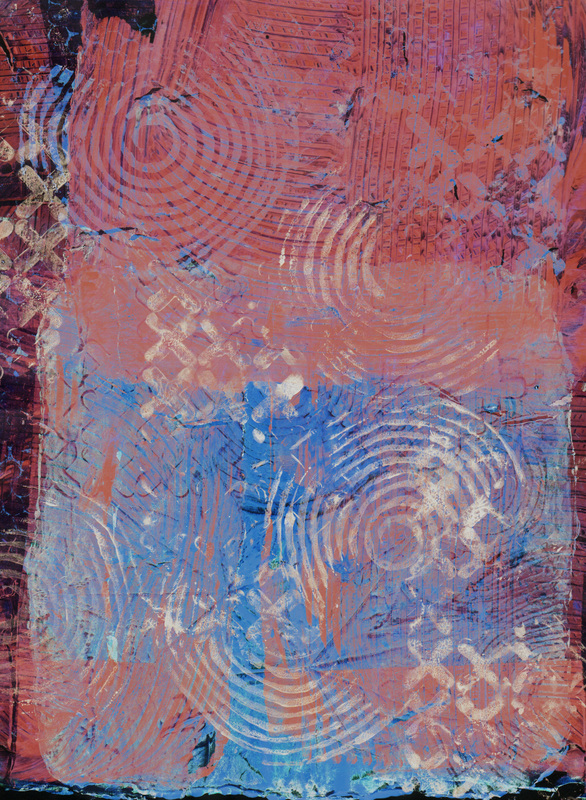 I took a large piece of cloth and printed several of these together and overlapping…thought I might use it for a background. 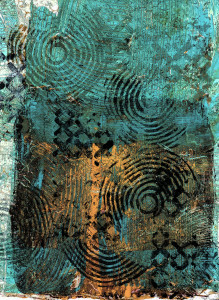 This looks like two prints too, one on top of the other. I really love what I get when I print on a piece of plexiglass, but I like the moistness of the jello, maybe that helps to keep the paint from drying out so fast. I will have to try some printing with a square plate. 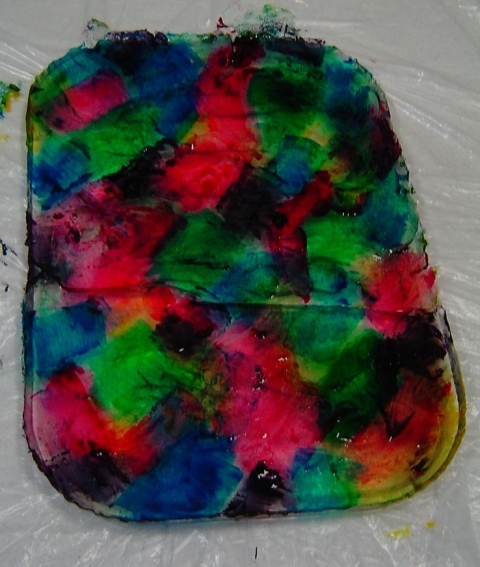 I also like the flexibility of the gelatin plate, meaning the “squishiness”, the give in it. That part is pretty cool.